Opera is an art form that is absurd and incongruous—or, as Samuel Johnson had it, "exotic and irrational." Accompanied by an orchestra, characters sing to one another to express their feelings. They fall in love at first sight. They can behave either in an unrealistically magnanimous, noble and self-sacrificing way, or very, very badly indeed. And often the heroine (sometimes together with the hero) ends up dead. Given its patent lack of realism or uplift, what explains opera's popularity over four centuries? And yes, I did say "popularity." The Metropolitan Opera in New York recently announced that its paid attendance for the 2016-17 season averaged a disappointing 75 percent. The company staged 225 performances (of 26 operas) in a house with a 3800-seat capacity, not counting standing room. That means that in this sub-par season the Met still sold more than 640,000 opera tickets. Despite this, opera is continually in crisis—mainly because no matter how many tickets are sold, the costs for mounting opera are higher than ticket sales can cover. The average ticket price at the Met is $158.50, yielding box-office revenue for 2016-17 of more than $100 million. But the Met's annual budget is over $300 million. The shortfall is covered by the generosity (and vanity) of rich donors and by wringing salary and benefit concessions from the artists and crews whose long-cultivated talents and hard work actually make the shows happen. It's no wonder that in the first half of the 18th century Handel's London opera companies went broke twice, even though he was producing the greatest operas of his time (his own). The aria. . .is a static mode. It is fundamentally about contemplation, and through contemplation the communication of mood to the audience. . .In some sense, then, arias stop time—they let nothing else happen while they unfold, allowing us to sample a kind of internal time, one in which the character's mind reveals itself. And what is said here about arias goes equally for all the contemplative parts of the opera: the duets, trios, and bigger ensembles. Curiously, they don't mention the expression of emotion, which is what I would have said that arias are "fundamentally about." They go on to qualify their observation by saying that "one of the great departures of nineteenth-century opera is that all these fixed forms may be liable to injections of outside action" (p. 25). Perhaps, you may be thinking, Abbate and Parker were referring to those benighted operas written before Mozart's time. But in Handel and the Opera Seria (a work that does not appear in Abbate and Parker's bibliography) Winton Dean says that in Handel's works the aria is "a means of dramatic expression" (p. 152). He goes on to detail the many ways in which arias in Handel operas illuminate character, reveal intentions, and, yes, dramatize emotion and conflict. "For a long time, the historical 'first' in this genre [of German-language opera] was said to be Heinrich Schütz's Dafne of 1627. . .the fact that Schütz was an established master of severe church music made him a particularly attractive candidate" (p. 64). ". . .the version [of Henry Purcell's Dido and Aeneas (1689)] that has survived is one arranged for performance at a girls' boarding school in London" (p. 66). The authors state that in the later 18th-century opera seria had "not changed much since Handel's day. . .with the action likely to be an evening-long celebration of the status quo, the final curtain closing as an absolute ruler heaps boundless wisdom and mercy on his humble subjects" (p. 127). As a characterization of opera seria in Handel's day or any other, this is perhaps deliberately cartoonish. It does not describe, for example, many of the serious operas of Vivaldi, Jommelli, Handel or Haydn. This characterization does seem to betray, though, an unwillingness on the part of the authors to engage seriously with serious opera. Opera before 1750 encompasses the works of Monteverdi, Cavalli, Lully, Charpentier, Purcell, Scarlatti, Vivaldi, Rameau, and Handel, not to mention composers such as Bononcini, Hasse, Jommelli, Leo, Pergolesi, Porpora and Vinci. Most of these composers are ignored. Monteverdi and Cavalli receive glancing attention; a few of the others are the subject of a sentence, a paragraph or a page. Handel is the primary focus of an entire section, but it is only 12 pages long (Wagner gets nearly five times as much space). Moving into the second half of the eighteenth century, Haydn's operas go completely unmentioned. From this book you would have no idea that Mozart was only the seventh-most-popular opera composer in Vienna, after Paisiello, Martin y Soler, Cimarosa, Guglielmi, Sarti, and Salieri. Salieri, Cimarosa and Paisiello are granted one-sentence mentions; the other composers in that list aren't acknowledged. In short, if you are interested in a history of the culture of opera and of opera's place in culture, this isn't the place to look. As an example of where the authors direct their attention, the "inexorable rise in the power and prestige of music publishers," a hugely important development in the later 19th century, is confined to a single remark (and a parenthetical one at that). In the very next paragraph, Wagner's "penchant for silk" is discussed at length, including a substantial quotation from one of his letters (p. 343). Other film references strain to make a point. Sure, perhaps the existence of Laurel and Hardy's The Devil's Brother/Bogus Bandits (1933), an adaptation of Auber and Scribe's Fra Diavolo, makes a point about the once widespread but now faded popularity of that opera. But what does the performance of "Largo al factotum" from Rossini's Le barbiere di Siviglia in Broadway Melody of 1938, or Lauritz Melchior singing "Winterstürme" from Wagner's Die Walkure in the Jane Powell vehicle Luxury Liner (1948) signify, other than that these are famous and readily excerpted arias? And despite the authors' apparent encyclopedic enthusiasm for movies featuring opera, they miss some highly pertinent examples. "Largo al factotum," for example, features in Peter Yates' 1982 film Breaking Away (not mentioned by Abbate and Parker) where it is not a standalone showpiece but an expression of townie Dennis Christopher's love of bicycle racing and also his social and romantic aspirations. Speaking of Rossini, Chuck Jones' great Rabbit of Seville is mentioned, but mysteriously absent is his even more brilliant Wagner parody What's Opera Doc? ("Kill the wabbit! Kill the wabbit!") And while we hear about the use of the prelude to Wagner's Tristan und Isolde in Fritz Lang's Blue Gardenia and in Lars von Trier's Melancholia, inexplicably the authors don't discuss its incorporation into Bernard Herrmann's soundtrack for Alfred Hitchcock's masterpiece of obsessive love, Vertigo. In the final chapter the authors pull together a more extensive discussion of opera on film (although they ignore its place on television). ". . .[T]o track 'opera' in cinema over the course of the twentieth and early twenty-first centuries is to see a kind of seismographic trace of its place in culture." They point to examples primarily from the first two decades of sound film and note that in more recent times opera appears more rarely in movies and when it does has generally become a signifier of "European elitism." "If the movie seismograph is correct," they write, "this falling-away on the part of the general public has been going on for more than fifty years" (pp. 548-549). This analysis conveniently ignores movies from the past two or three decades where opera plays a more complicated or different role, such as Moonstruck, Pretty Woman, La vita è bella (Life is Beautiful), Quantum of Solace, or, indeed, The Shawshank Redemption. And if TV is included, what are we to make of Puccini's "Nessun dorma" from Turandot becoming the theme of the World Cup, watched by billions? "Amid competition from increasingly revered masterpieces, writing new operas became ever more perilous" (p. 373). About opera after 1950? No—after 1850, when the programming at La Scala in Milan became dominated by revivals of Rossini, Donizetti, Bellini and Verdi. Concerns about the dearth of viable new operas are nothing new, it seems. The authors suggest that one reason for the theatrical effectiveness of Puccini's operas is their "blatant discontinuity" and lack of concern for "trivial narrative coherence." They give the example of Manon Lescaut, in which we never see Manon and Des Grieux during their blissful days of love. Instead we witness their meeting in Act I, and at the beginning of Act II discover that, after their breakup, Manon is living with another (richer, older) man (pp. 416-417). Another opera that reinforces this apparently paradoxical point is La Bohème, where we witness Mimi and Rodolfo vowing to stay together at the end of Act III, and at the beginning of Act IV discover that, after their breakup, she is living with another (richer, older) man. Puccini had a relentless focus on dramatic momentum, and to maintain it cut an entire act from La Bohème. But a few good insights can't redeem the whole book. 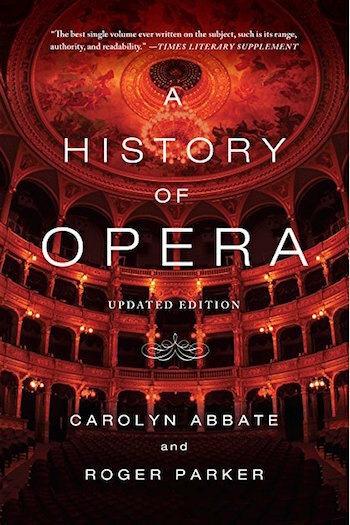 Abbate and Parker's A History of Opera is actually quite old-fashioned: in their view operatic history begins in earnest with Mozart, hits the bel canto high points of Rossini, Donizetti and Bellini, and reaches its apotheosis with Verdi and (especially) Wagner. Both authors are 19th-century specialists, and it shows: in this book it's as though the rediscovery of Baroque opera that's occurred over the past 50 years or so never happened. Most of the text is devoted to retelling 19th-century opera plots and pointing out musical details. Sometimes those details can be illuminating, but what's missing is a fuller sense of opera's context, significance and history. Opera is also more popular by the measure of ticket revenue: Over the same number of performances, 225, the Metropolitan Opera took in more money at the box office than Hamilton (more than $100 million versus less than $90 million)—despite the average ticket price at Hamilton being almost twice that at the Met ($300 vs. $158.50). The textual and musical sources of the opera are described in detail in Henry Purcell's Dido and Aeneas by Ellen Harris (Oxford University Press, 1987) and Henry Purcell: Dido and Aeneas: An Opera edited by Curtis Price (W. W. Norton, 1986), neither of which appears in Abbate and Parker's bibliography. For comparison's sake, opera before Gluck is covered in 252 pages (out of 785 pages of text, or about one-third of the total) in A Short History of Opera, 4th ed. by Donald Grout and Hermine Weigel Williams (Columbia University Press, 2003), and in 85 pages (out of 364 pages of text, or about one-quarter of the total) in Opera: A History by Christopher Headington, Roy Westbrook and Terry Barfoot (St. Martin's, 1987). Although one of the characters says that "I have no idea to this day what those two Italian ladies were singing about. Truth is, I don't want to know. Some things are best left unsaid." In fact, this duet happens at a dramatically crucial point in the opera and sets in motion the action which will conclude it—again, so much for the static nature of song in opera. As for the beauty of Mozart's music complicating the comedy of Da Ponte's libretto, Bernard Williams makes this point more tellingly in his brilliant essay on Cosi fan tutte published in On Opera (Yale University Press, 2006). Quoted in The New Monteverdi Companion, edited by Dennis Arnold and Nigel Fortune, Faber and Faber, 1985, pp. 34-35.